Many attempts have been made to emulate the innovative design of Genie material lifts, which is a testament to the originality and industry leadership of the Genie brand. Now, almost five decades after the first Genie Hoist was developed, the key factors behind the success of the Genie material lifts remain the cornerstone of the products: innovation, lightweight, and easy to use. The lifts are purposefully designed to enhance productivity in a wide variety of applications. As well as the attributes of quality, durability and performance embodied in the Genie brand, Genie offers genuine parts, service and support across Australia and New Zealand. 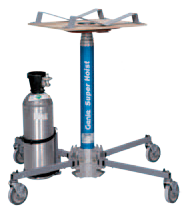 Since the introduction of the original Genie Hoist, Genie has been developing sound lifting solutions for the workplace. Today’s Genie Super Hoist™ material lift continues the heritage of innovation. The contemporary design is incredibly compact and designed to lift, position and install a wide variety of materials, including metal and fibreboard, air ducts, overhead sprinklers/plumbing, plasterboard and electrical fixtures. This portable telescopic, pneumatic hoist that can lift 136kg loads to heights of 3.8m, or 113kg loads up to 5.6m. Beyond the Genie Super Hoist lift, a broad range of associated material lifting solutions are available from Genie in this category. The Genie Superlift Contractor® (SLC) material lift is ideal for construction firms and all types of contractors and is well suited for industrial applications and HVAC installations. The SLC is hand winch operated and can be easily operated by one person with the ability to lift, lower and move loads of up to 295kg. The Genie Lift™ product comes in three base models and is ideal for all your material handling needs. It is well suited for shipping/receiving, lifting heavy material to or from shelves, installing and repairing HVAC components, lifting and moving parts and other manufacturing applications. A common element across the Genie material lift product line is ease of operation. These units are in high demand right across the world amongst a diverse array of trades and applications. Indeed, the range of models within the Genie lineup is the biggest in the business. Genie lifts. Affordable, versatile and well supported. There is much to like about the range of Genie lightweight material lifts in the Australian and New Zealand market.